I want to see this couple!!!! I feel that they will be a very interesting combo. Thanks for making the thread for them! I haven't watched WGM again since Joongbo couple left (I miss the original couples!) But hen when I checked the WGM thread, there are so many positive feedback about the new couples (esp Junjin-LSY and Shin Young and Sung Rok)so I decided to give ita shot again.... and I'm totallty in love with this couple. Shin Young is too adorable and Sung Rok is so kind to her. He seems like a really nice guy and Shin Young who usually is sooo funny shows a more 'girly' side of her which I really like. Despite the obvious height difference, I hope they can be a regular on the show.... the chemistry was there ( At least I think so) and I think they are sweet yet funny at the same time (not overly trying to be funny). They are my top list favorite couple now, and hope to see more of them! I think this is going to be really sweet. He's so nice and she's so funny. I think she'd be the one breaking the 'awkward' silences. haha! I like this couple very much!! They were so adorable! The dork that I am, I was teary during that train scene. I hope somebody subs episode 42. I have yet to see this new couple. But I don't doubt their chemistry. LOL. I know they're be very.. entertaining together. Haha. I kind of wanted a more realistic partner for Shin SungRok, but I think this will do for now. Haha. We'll see. Shin SungRok is adorable. I loved him in Thank You. 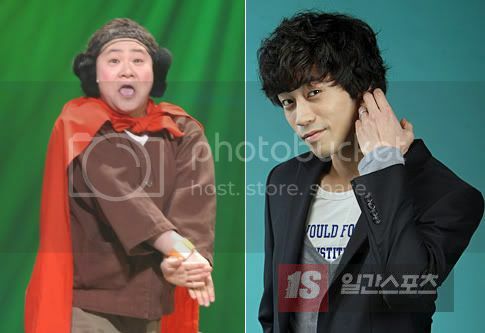 I love Kim ShinYoung, but.. LOL. The pairing is just so hilarious! I'm looking forward to seeing this couple. i haven't seen the subs for this yet but im anticipating this couple! Here's hoping they're to stay. I think this is a fresh pairing. I got uneasy when SSR wished he got a pretty girl, but I think their night went well. He's sooo nice to her. FINALLY! Somebody made a thread. I am so inlove with this couple. They look so adorable together. I love how Sung Rok treated Shinyoung. cut down on the food. omg i love this couple! they're so cute together! i loved the part where they're eating breakfast(?) and she was sucking her fingers and started tearing those gogi and she went under the table to bite her gogi lolllllllllllll oh mannn shes sooo funny and cute at the same time! and i especially loved the ending when they had to decide if they should continue...especially when he was like what happened to your eyelashes and she was like they got off work and went home lol so cute. i hope they become the next couple! hwaaaaa im looking 4wrd to this couple.. I loove love love this couple! Shin Young is just adorable and funny at times! And look at Sung Rok.. He was so nice and caring.. I like their hands..Hers so small and short..
shin young was born in 1984 ?!?! oh my, I thought she was like.. 30ish?!!?!!?!??! i think they will bring out the best in each other! I watched ep 42 without subs and they are so cute! !